Also known as Confetti Jelly in my house. Why? Because I can only write so much on the top of a canning jar lid. It is a quite tasty version of the traditional pepper jelly which has had onions and garlic added to the mix. I decided to start a category of “Using It” because after you have put up jar after jar of various food stuffs – at some point you need to consume them. There are always obvious ways of eating things: tomato sauce into spaghetti, jelly on toast, salsa on chips yadda, yadda, yadda … But sometimes you get bored. And sometimes you are sick of the same-ole, same-ole. And sometimes you run out of blackberry jam. Then you start thinking to yourself – I have an entire shelf in my cabinet with various jams and jellies. You consider the peach, fig and orange-thyme-coriander. And then you have a crazy thought – Thai peanut sauce. Thai peanut sauce has peanuts, garlic, onions and peppers in it, the flavors meld well. I know, crazy. But I am willing to throw myself off this particular cliff for y’all. Just to prove I did it! You know what? It was delicious. It was a savory PB&J with a little spicy kick in every other bite. It was an adult PB&J. I let my husband have a bite just to make sure that I wasn’t completely crazy. He was quite skeptical, but with one bite I won him over. I don’t know if I will be able to go back to regular jelly. Luckily I have about 4 more pints of this stuff. I tried to take an interesting picture of it, really I did. This delicious jelly is not a creation of my own, but from a recipe I found on the GardenWeb forums when I had two sacks full of banana peppers in my ‘fridge. Luckily GardenWeb has a wonderful archive and you can find it for yourself: Gina’s Onion, Garlic & Pepper Jelly. I personally used a combination of Banana Peppers and Jalapeno’s for the 1 1/2 C of chopped peppers. Another substitution I made was using red onions. The jar of jelly that my hubster had opened was labeled “mild” which meant that there was 1/4 C of jalapenos in the mix. You can up the spicy pepper quotient to your heart’s desire. In the original post Gina suggests using the jelly as a glaze when roasting chicken and I must tell you that works great as does glazing pork loin. I canned it in pints – but in retrospect should have done 1/2 pints so that it was easier to give some away. Somehow only having 6 pints made me stingy, where if I had 12 1/2 pints I would have distributed them like mad. Do y’all have any other ideas what I could do with this jelly? 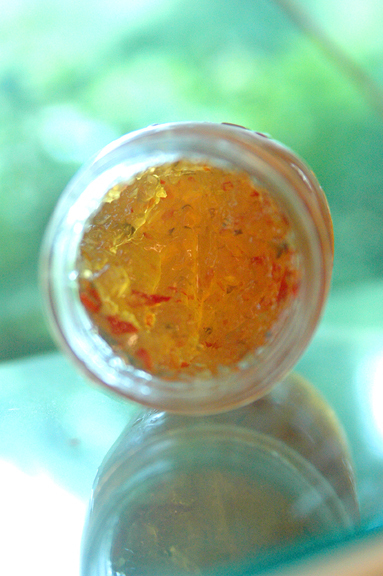 We use our hot pepper jelly for all sorts of things! On Biscuits, English muffins and of course on a PB&J sandwich! Even the habenero jelly! Delish. Ok, I love peanut butter and that sounds bizarrely fantastic! I make a lot of pepper jelly and I’m pretty basic with it. I use it on cream cheese with crackers. Or in a salad dressing that I put on spinach. I like it on a cheese sandwich too. Oh, and I love the ‘using it’ idea! 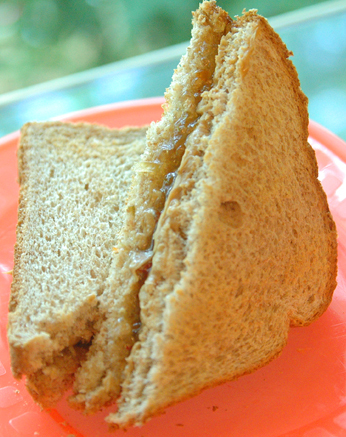 I tried your hot pepper Jelly PB&J idea and I LOVE IT. oh wow what a great re-newal of an old fav. I looked for the recipe for Gina’s Onion Garlic and Pepper Jelly but could not find. Could you send the recipe? Sounds good! A friend says she uses hers as sweet and sour sauce over pork fried rice. I know this was originally posted 6 years ago, but Wow! I found it very entertaining and informative. 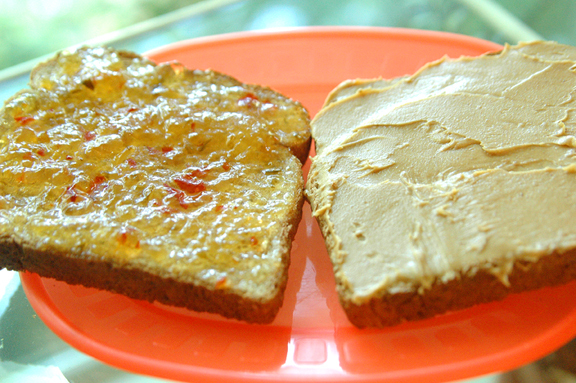 As much as I love peanut butter and hot pepper jelly individually, I’ve never tried it together. Thank you! Your writing is funny and interesting! Thank you! It is always nice to hear such kind words. And it I should wonderful to know that some of these posts are still useful to people.